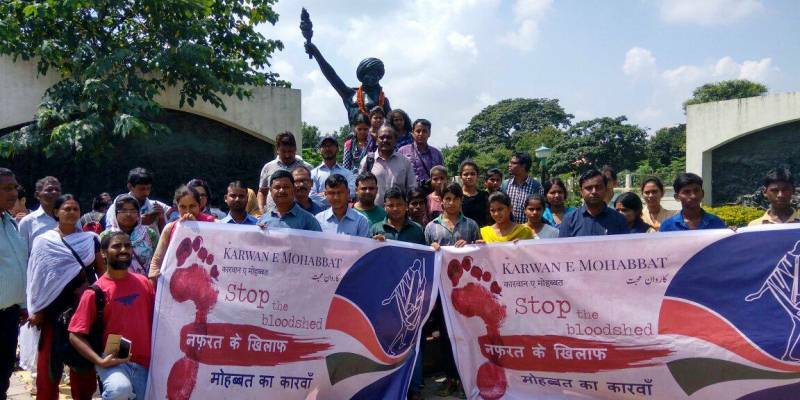 MUMBAI: An Indian caravan – called the Karwan-e-Mohabbat, or “Caravan of Love”– is traversing seven Indian states in two weeks with a “call to conscience” for India’s Hindu majority, according to The Guardian. Led by veteran activist Harsh Mander, the caravan is escorted by police which has now become a government requirement for Mander’s stops – each one with the family of a victim killed in violence motivated by caste or religious difference. “We have to understand times of hatred are spreading like a contagion, and remaining silent amounts to condoning or actually supporting that violence tacitly,” says Mander. The journey started on September 4 in Nagaon, in India’s north-eastern state of Assam. There they visited the families of two teenage cousins who had been lynched on the suspicion that they were cow thieves. It will come to the end of its main journey this week in Godhra, in the western state of Gujarat, where riots between Hindus and Muslims in 2002 killed more than 1,000 people and led to the state’s then-chief minister – now prime minister – Narendra Modi being barred entry to the United States and the UK. Hate crimes, especially on religious grounds, have become increasingly prominent since Modi’s Hindu nationalist government was elected in 2014. Statistics show some have increased in recent years. More than 70 instances of violence in the name of cows, an animal revered by most Hindus, have been recorded in the past seven years – the vast majority since Modi was elected. Invariably, the victims are Muslims or low-caste Hindus. Last week, against the advice of police – and threats from local Hindu extremist groups – the caravan visited the spot in Rajasthan where, in April, a 55-year-old dairy farmer was beaten to death by a mob of self-styled “cow protectors”. Mander has gathered a group of dedicated volunteers who helped to crowdfund the entire trip. They are an eclectic mix – lifelong activists, including a mother and son, along with photographers and seven young priests-in-training from a seminary in Delhi. The caravan keeps a rigorous schedule, visiting two families each day: one in the morning and another in the evening. As they go from state to state, they pick up local activists who work in the areas the group visits. “We want to create a network of peace communities in every district,” said Suroor Mander, one of the organisers. The mood turned serious when they arrived in the town of Vadavali in Patan district. In March, higher-caste men from nearby villages had clashed with the Muslim men of the town, burning down several houses, injuring many and killing one person. Police have filed charges against the two sides, according to Ahmedabad-based lawyer Shamshad Pathan, who represents the family of the man killed. One against 13 Muslim men in the village, and one against 34 members of the higher-caste members. Pathan and other activists are calling the round of charges against the Muslim men a “cross case” – a pressure tactic by the police where they file charges against victims to prevent them from speaking out. The local head of the village, a Muslim man, was sceptical of the caravan initiative: he says the violence was no hate crime, just a fight that got out of hand. It’s a things of elegance as well as it’s built like a tank, with extremely distinct laser-cut stainless steel grates It’s the only gas grill I recognize.